Meet my friendly neighbourhood 'White-breasted Nuthatch' (Sitta carolinensis). Trying to take photos of her is like trying to catch a missile in a spider's web!!! Although not the best, I did manage to capture her in true 'Nutty' Nuthatch form ... UPSIDE DOWN! 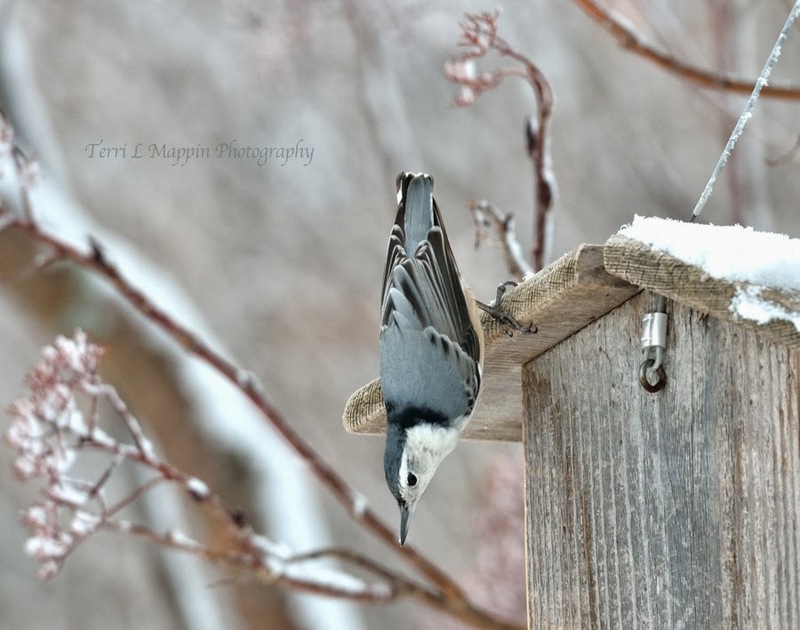 Yes, Nuthatches forage upside down! Thank you! She's a funny bird! I love their colouring Olga! such a wonderful angle you have caught this bird in! They are such funny birds! Rather entertaining! I love nuthatches and you're right they are really hard to photograph. They never seem to stay perched, their feet are always moving. I love watching them Matt but they can give you vertigo at times! Haha! Yes, they are constantly on the move! Birds are so amazing , upside down and all! They are such crazy lil' birds! So fun to watch!